From the exit, go straight for about 400 meters. Turn left at the “Takebashi” intersection and continue along that same road. Turn left at the “Kudanshita” intersection and continue for another 200 meters. ※ Time: Approx. 5 min. From the exit, turn left and then go straight. Turn left at the “Iidabashi 1” intersection onto Mejiro-dori Avenue. 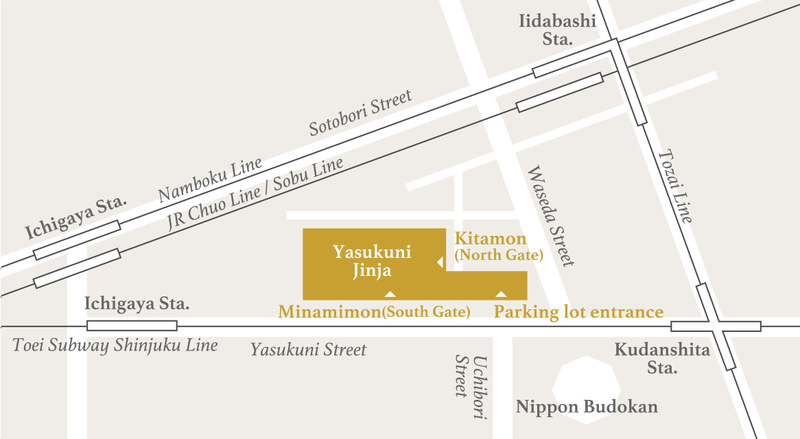 Turn right at the “Kudanshita” intersection and continue for another 200 meters. Get off at the exit and go straight through the “Iidabashi” five-road junction (toward Kudanshita). Pass under the tracks for JR Iidabashi Station and continue straight. Turn right at the “Kudanshita” intersection and continue for another 200 meters. Use of the parking lot is free of charge for visitors taking part in formal worship at the Main Sanctuary.